Hertha Berlin were delighted to finally grab a win against a big club after getting the better of ten-man Bayer 04 Leverkusen on Matchday 15. Fabian Lustenberger (Hertha defender): "The win will do us a lot of good. The fact that we've won directly after having lost last week shows that we have a really great group here at the moment. I'm really pleased for (goalscorer) John Anthony Brooks. It was about time he scored again!" 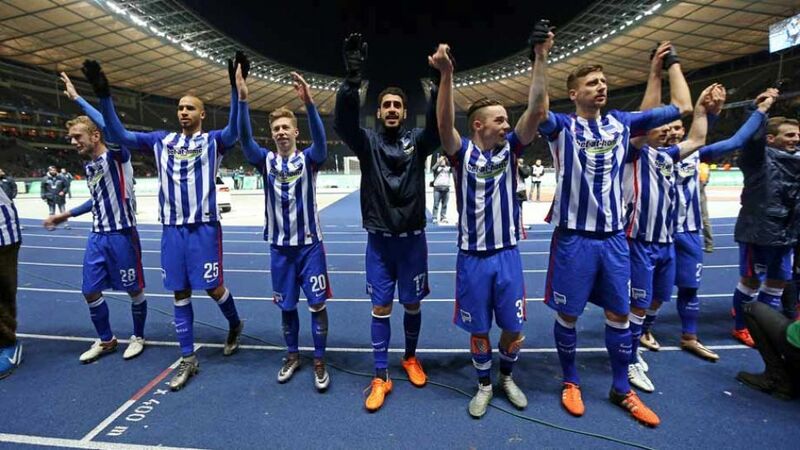 Vedad Ibisevic (Hertha striker): "Now we can stop talking about the fact that we haven't beaten a big team yet!" Marvin Plattenhardt (Hertha defender): "You could see that we really wanted to beat a big team. We were concentrated in every phase of the game. When you spend so much time practising set pieces, it's nice to be rewarded (with an assist from a corner)." Pal Dardai (Hertha head coach): "We changed our tactics. We defended aggressively, and that surprised Leverkusen a bit. The first half an hour was perfect. The red card unsettled us more than it did them, but we were cleverer in the second half. It was a very good day for us all." Christoph Kramer (Leverkusen midfielder):"I thought we were better with ten men than we were with eleven. But even with ten we weren't very good." Roger Schmidt (Leverkusen head coach): "Hertha deserved to win. We knew that they are very disciplined, so it would be difficult for us to get into the game. The way we conceded the first goal was unlucky."